Biosphere Expeditions’ work in wildlife conservation has been recognised in the prestigious Responsible Tourism Awards 2010. It took the accolade in the ‘Best Volunteering Organisation’ category after impressing a panel of 13 judges, chaired by Professor Harold Goodwin, who heads up the International Centre for Responsible Tourism in the UK. Commenting on Biosphere Expeditions the judges said: "Biosphere has continued to show its strength in combining strong tourism experiences with solid scientific research. Their commitment to transparency sends a clear message about the value of volunteering, where 66 per cent of a volunteer’s money goes directly to the project." 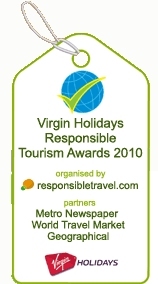 In 2010 almost 1,800 individual nominations were made for the Responsible Tourism Awards in 13 categories. Biosphere Expeditions director Kathy Gill said: "We are delighted that our achievements have been recognised by the high-profile judging panel, and feel that we share this honour with everybody who has been with us on expedition. Thanks to our team members’ commitment, hard work and financial contributions we are able to make a difference in wildlife conservation. Our whole philosophy is that ordinary people from all types of backgrounds can take part in scientific research. For one or two weeks they become an extra pair of legs, or eyes, enabling the scientists to cover more ground and see more things, hence helping to collect more invaluable data." Biosphere Expeditions takes around 500 volunteers a year, with a maximum of 12 on any one project. It is currently running a range of expeditions from helping with research into the snow leopard in the Altai Republic to coral reefs off the coast of Oman.